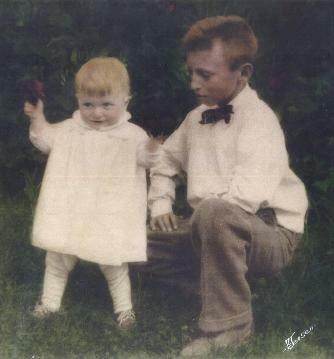 Two weeks after Hynek and Antonie [Mendlik] Hynek moved into their new house at 710 5th Avenue NW in Mandan, a son was born to the couple at home on October 16, 1917. Both parents were naturalized US citizens who had immigrated from Bohemia, today known as the Republic of Czechoslovakia. But his father, though proud of his adopted country, insisted in preserving their Czech heritage and gave his son (and later daughter Libuse) a Czech name. Ervin attended St. Joseph�s School for about 3 years and then Mandan Elementary School. Scouting was among his boyhood activities. He earned his Eagle Scout rank and continued supporting the Boy Scouts of America by serving as scoutmaster in his early 20s. Nicknamed "Riggie," his high school buddies included Bill Ordway, Jack Shinners and Bill Reko. Near the end of senior year, their request for Senior Skip Day was rejected. Despite his mother�s warnings, the foursome instead marched around the senior high school building banging pots and pans and generally disrupting classes. When the administration called his mother to intervene, she refused politely, saying that she had warned them against the action and she was not coming in to discuss it. Ervin participated in a wide variety of activities including student government, plays and musical performances. He played �Indian Joe� in the MHS production of Tom Sawyer and the male lead role in their senior class play Seventeen. Ervin was a talented violinist and sang with a deep base voice. During his teen age years, he was sought after as a vocal soloist, and as a violinist in quartets. He was also voted best male dancer of his high school class. Softball and boxing were among his favorite athletic pursuits. Ervin Hynek Rybnicek graduated from Mandan High School in 1935. Ervin attended the University of North Dakota for two years. His activities included singing with the Madrigal Club and took both voice and flying lessons. He but did not return in the fall of 1937 due to limited financial resources. After leaving college, he moved to Cleveland, Ohio for two years where friends and family of his parents resided. He worked for the Metropolitan Live Insurance Company there. But he returned to North Dakota after economic conditions back home improved. Ervin wrote and conversed fluently in the Czech language, which was spoken in the Rybnicek home. This skill was an asset many times, among them when he went on the road to sell monuments for his father�s business. In many Czech communities, the language was spoken and of course those fold loved to be address in their familiar language. In April 1941, Ervin was inducted into active duty while in the National Guard 188th Field Artillery Unit in Mandan. After the start of World War II in December 1941, the unit left for Fort Warren in Cheyenne and eventually to Fort Lewis in Washington State. From Fort Lewis, Ervin and several other soldiers were sent to Officer Candidate School in Fort Sill, OK (the site of the principal artillery araining school) After Ervin was commissioned 2nd lieutenant, he was reassigned to Camp Roberts, CA to train soldiers. While at Camp Roberts, Ervin met Leona Kelley. 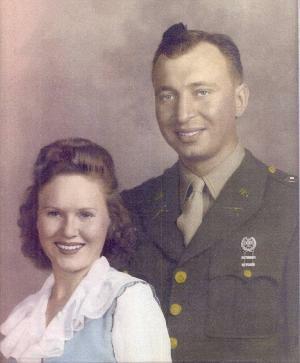 They were married on September 1, 1943. Ervin was later reassigned and dispatched to study at Officers' Training School. Two weeks after their son Steven was born June 26, 1944, Ervin was deployed to the Pacific Theater of War. Promoted to 1st lieutenant, he was assigned battery commander of the 363rd Field Artillery 96th Division. 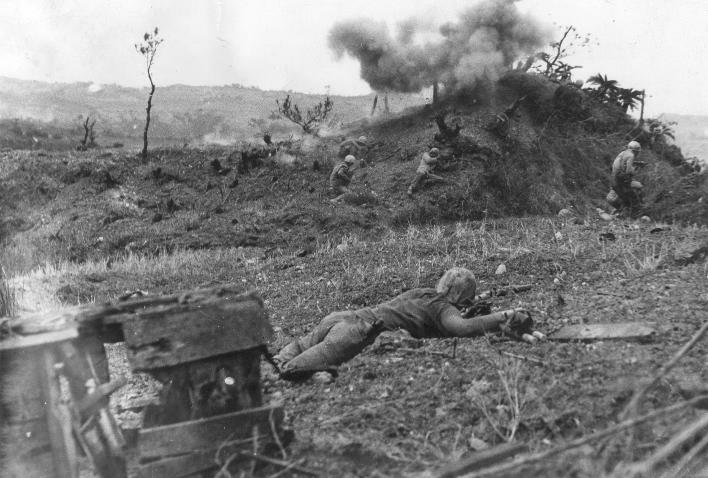 The unit was involved in the invasions of Leyte, Phillipine Islands and Okinawa. Ervin was killed in action on April 2, 1945 one day after they landed on Okinawa. He is buried beside his parents in Union Cemetery, Mandan. His widow later remarried. Both Leona and his son Steven currently live in California. The Society would like to thank MHSoc lifetime member Libuse [Rybnicek] Imbrone for sharing this information on her brother with us. All images used with permission.